A bit further down the back garden. I love your path - and the choice of plants - beautiful. 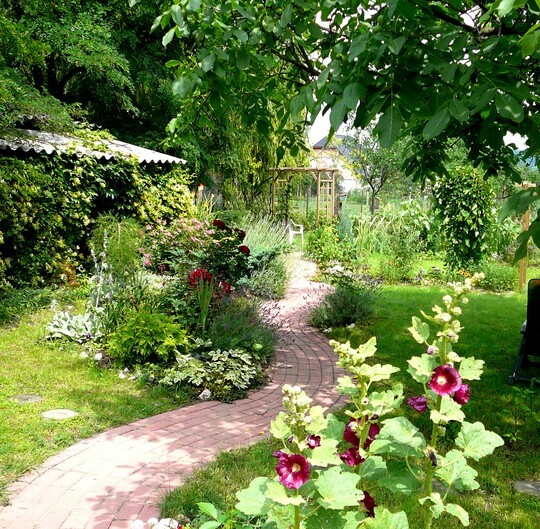 Marvellous garden. Its got everything. Awesome landscaping, looks very natural and easy on the eye ! Thankyou all very much for your kind comments. I am so thrilled that you all like my garden so much. It encourages me no end. Being an ex-pat a long way from home there are not many people around here who speak English, so this makes the encouragement I recieve from GOY friends all the more important to me. I enjoyed walking down your path Chris,nice garden. Thanks Scotcat. So glad you joined us in the walk down the path. Wow Chris this look fantastic! really invites you to walk down the path! Thanks ladies. All are welcome to wander down my path. It's not just a lovely garden picture it is a very good photograph. I wish I could do that good. Thanks Poannua, I just pointed the camera and took it. I can't cope with complicated cameras. The digital cameras do take good shots these days. My husband says a good lens makes a difference, and he bought one with a Lieka (Spelling???) lens. Oh WoW chrispook, Absoloutly Breathtaking, Dee..
Great not to see straight lines in a garden! Excellent! Nobody could resist going to have a look around the next corner. Very nicely done. Makes for a nice stroll.